There are HILLS in NL! Yes, there is a hill in the Netherlands. I found it today on a modest 70-mile ride south down the coastal sanddunes to the very English-feeling resort (you could almost hold a party conference here) of Bloemendaal, just north of Zandvoort. 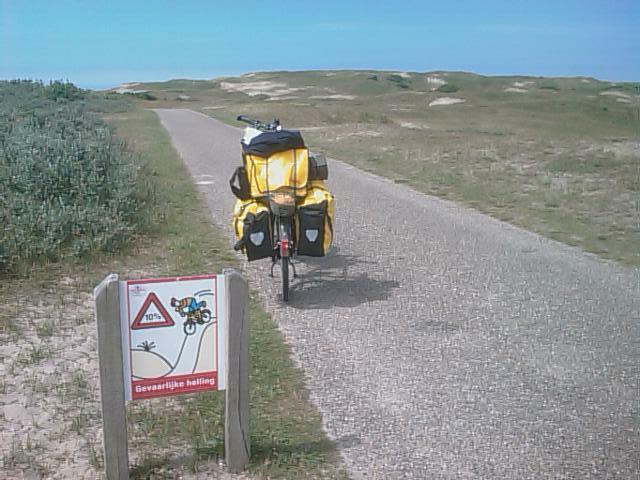 The hill was a pretty gentle affair, but I was amused by the signs warning the Dutch – who do indeed cycle in spectacular numbers, on spectacularly safe-and-boring sit-up-and-beg monsters – of the dangers of being tipped over the handlebars. Just 10% gradient, 1-in-10, lasting about 20 metres. Still, it was nice to have to puff again, hauling my 50 kilos of gear (bike best part of 25 kg, and luggage the same again) up a bit of a climb after so many hundreds of Very Flat Miles. Or actually, Very Flat Kilometres. So far altogether since Easter 3555 of the former, and about 5700 of the latter. Sounds quite a lot, I agree. The secret isn't actually to do huge mileages every day or ride very fast, but just to keep going, regardless. Once in the rhythm, it is enormously rewarding – endorphins, adrenaline, feel-good hormones as the body just does what it was designed to do, work physically. Of course, the slim, taut, finely-honed Adonis look will be lost very fast when I'm home (pity there's no-one here apart from Raven to appreciate it…), but it's a very good feeling, however temporary. So, lots of sand and dunes this afternoon – including under, and increasingly inside, my tent at tonight's campsite. It's a bit like Holkham in Norfolk – our favourite family beach – only 1000 times more extensive. And some of the most pleasant cycling of the whole trip so far. The amount of heavy technology being used to farm these fields and the volume of chemicals being sprayed, super-efficient, individually plant-targeted from vast cantilevers behind tractors or purpose-built engines-on-stilts, just takes one's breath away. All agriculture heavily fossil-fuel dependent – fuel for the machinery, raw material for the fertilisers and for the pesticides. No wonder food prices are exploding. And no wonder Dutch vegetables – tomatoes especially – taste of nothing. Thought continued in the next blog…. PreviousThe digit that saved a nation? NextDykes and perspectives. And BBC Europe.